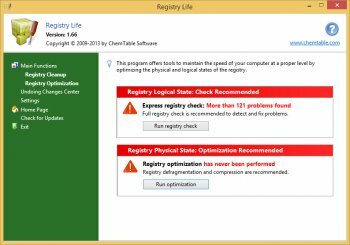 Registry Life is a utility for speeding up the system by fixing the registry errors, compression and defragmentation the registry. Registry cleanup function performs search and repair of a vast number of different registry problems. Unlike other programs, the software performs the registry optimization on system startup. Defragmentation and compression in automatic mode can be performed according to a schedule set by the user. Some pros state that Registry cleaning is useless, some even say that is may be dangerous. As a non-expert, I believe it may be dangerous indeed, but it may be helpful (I've experienced both) if and when only the Registry cleaner is adequate, skilled, pro. I think, having tested it, that this 'Registry Life' fulfills my requirements. Ok so I give this program a second go now that they "fixed" the startup program. I run it and it runs it's logical scan and find 58 problems, so before I let it fix the problems I want to make an image. So I click on the x to close the program and it hangs, waited almost two minutes before using task manager to close the program. I've been running my computer for 3 days straight so I wanted to reboot my computer before making the image (True Image) etc. well I was shocked to find that after the reboot my screen resolution was changed from 1280x1024 to 1024x768, what the ? I'm sorry but first the program won't run, now it hangs on close and it changed my screen resolution when I did nothing but let it scan. How can I trust such a loopy program with something as important as the registry. Does not support x64 systems! The Beta 2 version fixed the problem and the program works great now. 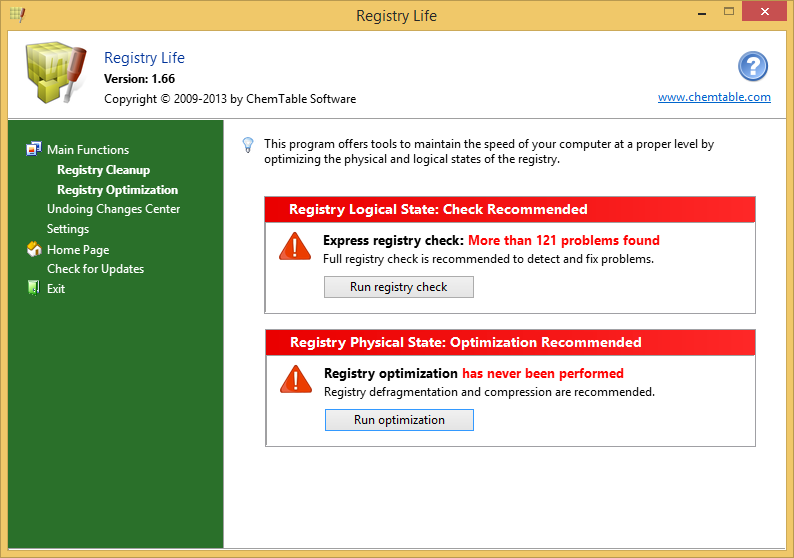 I had the same problem with Registry Life Beta 1, but if you try this new version I think you'll agree it is a very good registry tool.